In this issue, T&T hits the road in Wisconsin, enjoys jazz in the Dominican Republic and takes a look at the South African barbeque obsession. Then we cruise aboard the gorgeous SV Mandalay in Grenada and stop in at a beer oasis in the Arizona desert. 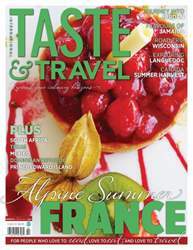 We journey to Jordan, eat a little bit of everything in Spain and wander the French Alpes in search of tasty treats. We top it off with the ultimate experience, a whiskey diner in Kuala Lumpur with Scotland’s chef of the year. Summer is in full swing with T&T!